On July 17th 2014 MH17 was downed by a BUK-M1 missile launched south of Snizhne. This happened in the middle of the war between Russia and Ukraine, that the Russian propaganda machine franticly tried and tries to portray as a civil war it has nothing to do with. Ukraine has similarly franticly been blamed for the downing of MH17, by Russian propaganda, MOD and government alike. In the worst case the public opinion and MSM think it was 'an accident by inexperienced separatists who didn't know how to handle the BUK given to them and wrongly pushed the launch-button'. 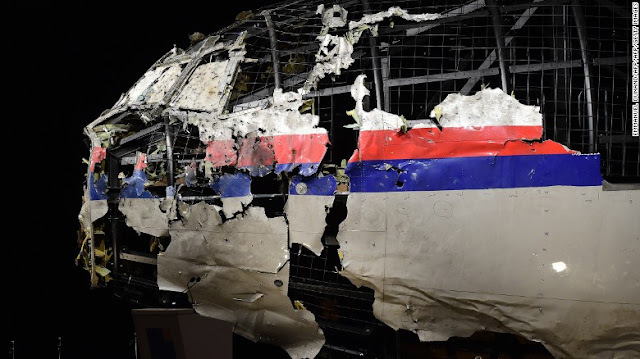 In this blog I want to investigate what effect the MH17-downing had on the war. At what moment did it happen and how did it change the war? After 'Maidan' and the killing of the heavenly hundred, some sort of 'local uprising' began in the Eastern provinces of Ukraine, where a lot of ethnic Russians reside. There was a lot of violent provocation, defection, bribing, propaganda and you name it. The focus (or frontline) was on Slovyansk and Kramatorsk. But clashes where also in Mariupol, Donetsk, Luhansk, Horlivka and all the border crossings. In response Ukraine started the Anti Terrorist Operation or ATO. After a troublesome and deadly start they managed to surround Sloviansk and liberate it together with Kramatorsk. In early July the Ukrainian army advanced all along the border up to Izvarino tot try to cut of and control the border with Russia, through which men, supplies and equipment poured into Ukraine. It looked like Ukraine was doing very well and might indeed be able to get the job done, although their troops were dangerously exposed and stretched along a long frontline. At the level of Marinovka fierce battles happened all the time to try to cut off the Ukrainian border troops. A rich supply of MANPADs meant that a lot of Ukrainian aircrafts got shot down and Russia was delivering heavier AA equipment such as Strela-10 and later Panzir as well. Yet, despite the problems it's Air FOrce and border troops where facing, the Ukrainian Army was on the winning hand. Something had to be done to turn the tide and so Russia started to shell the Ukrainian border units from Russian soil, but of course portrayed this as 'separatists artillery'. On July 16th videos emerged from Russian GRADs near Gukovo firing into Ukraine. Russia could no longer hide its involvement if this would widely become known. The next day MH17 was shot down. 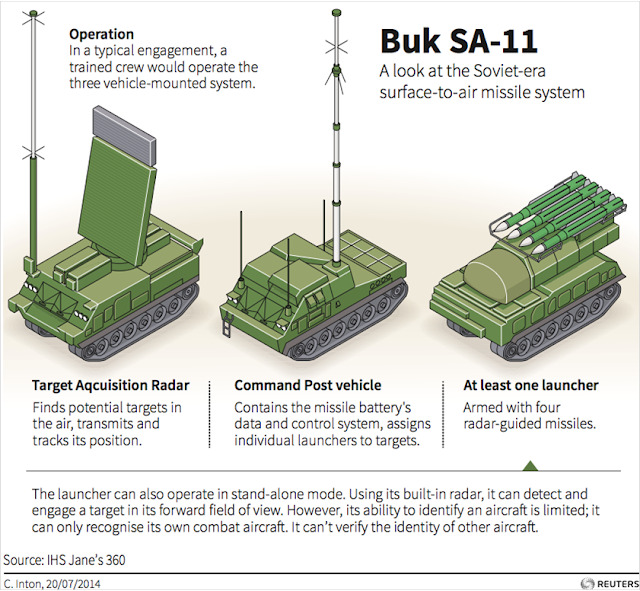 A Russian BUK was driven into Ukraine and it shot down a passenger plane. It looked like the separatists made a mistake, because they thought it was an AN-26 but it turned out to be a civilian plane. But the MH17-BUK was positioned very close to the Russian border and later it became clear that a Russian BUK battery was operational near the Ukrainian border. They easily could have communicated with the MH17-BUK and given it data and instructions. Directly after MH17 Ukraine started their next phase and tried to surround Donetsk, Horlivka and Luhansk, the biggest cities in the area. But their border units got completely crushed by Russian artillery across the border and crossing the border. Still their was euphoria among the Ukrainian staff and volunteer units where ordered to advance to Ilovaisk and Shaktarsk. Also it looks like Ukraine tried to liberate and secure the MH17 crash site, so international investigation could be done, but they never succeeded in doing so. The volunteer battalions got heavy resistance and this turned out to be because of large invasions from Russian into Ukraine. The first East of Marinovka, the second south of Ilovaisk and the third towards Lugansk Airport. Eventually this crushed and decimated the Ukrainian units there. So after MH17 Ukraine was dramatically loosing the war. Minsk peace negotiations tried to stop the parties from fighting, but for Russia this was more part of their plan, to stop Ukraine to retaliate, fight back or attack in an unexpected area. Thus Russia could concentrate their attack forces on grabbing Donetsk Airport and Debaltseve one by one. The downing of #MH17 happened literally in the turning point of the war. Before the downing Ukraine was winning. After the downing Ukraine was loosing big time. When Russia took Crimea, the whole world was looking their trying to figure out what was happening with these unidentified little green man claiming to be 'self-defence'. When it started to turn out these were Russian soldiers and thus Russia was taking over Crimea... MH370 got lost over the ocean. All the attention of the world turned away from Crimea towards the search for MH370. Putin could easily finish the job without getting disturbed. The downing of MH370 was an operation of 'military precision'. People EXACTLY had to know what they were doing (such as turning off the transponder) in order to have MH370 get lost. Whether you want to believe MH370 was an accident or a deliberate Russian operation, it for sure was a distraction to the Crimea invasion anyway. With the world looking at Donbass and becoming aware of the Russian involvement a distraction was needed. And there were two. The downing of MH17 was a distraction for the cross-border artillery attacks and the White Truck Charade at Russian Donetsk was a distraction for the invasion East of Marinovka and later Ilovaisk. As a distraction for the cross-border shellings, MH17 was a Russian operation the separatists did not need to be aware of. Why would Russia tell 'local warlords' or even it's own military personnel working there what exactly it's mission was? Even Russian soldiers invading Ukraine were told they were going on an exercise. Downing a civilian plane is a secret mission as little people as possible need to know details of. Not even the Russian crew in the BUK needed to know the exact purpose of their mission. All they had to do was to connect and communicate with the Russian BUK battery near Kuybyshevo and follow orders. And furthermore tell everybody an AN26 was downed and get out of there asap. The downing of MH17 happened in the middle of the turning point of the war. Before MH17 Ukraine was winning, after they were loosing. The MH17 BUK was able to (and therefore must have) connect(ed) with the Russian BUKs. The crew could have gotten data and instructions from their colleagues and superiors within Russia. The effect of the MH17 downing was that Ukraine's air force got paralyzed and nobody was interested to learn about Russia's cross-border shellings. As such Russia had a perfect motive to have committed this crime.